If you’re like me you tend to reward yourself for tackling & completing a more challenging book with the succor of the “easy read”: a novella, a book about music, or perhaps even a nyuk nyuk inside-baseball (literally) history of the Montreal Expos. Not exactly sure what I was thinking with this one. I frequently read and enjoy Jonah Keri's baseball writing on the Grantland website, so out of a sense of loyalty and curiosity, and because I’d come through the cathartic crucible of just having completed Flannery O’Connor’s “The Violent Bear it Away”, I decided to check out his new book on the Expos, a team I always found fairly comic, as baseball teams go. It also probably had something to do with a “wacky 1970s sports book” culture that’s developed over the years; I suppose I hoped this one might join the ranks of Terry Pluto’s “Loose Balls” (oral history of the ABA), Dan Epstein’s “Big Hair and Plastic Grass” and Murray Greig’s “Big Bucks and Blue Pucks” (World Hockey Association history). That was the hope anyway, but Keri’s book is really more of a love letter to his favorite boyhood club, with way too much clipped prose and forced hilarity – the sort of things that are really funny when you’re 15 years old (mascots, nicknames, terrible ballclubs). I mean, the Expos probably never really had a chance in Montreal; the fact that they stayed for 30-something years despite awful parks, poor weather and a rotten financial structure that included tightfisted owners and a rapidly weakening Canadian dollar was a minor miracle in itself, and a clear demonstration of the oligarchical nature of organized professional sports. The team made the playoffs only once, though Keri hyperbolically makes much hash of the strike-shortened 1994 season that ended with the Expos in first, with much conjecture about how that was the year they probably might have any maybe could have “won it all”. I mean, I know the feeling. As a San Francisco Giants fan since 1976, it was only the exorcism of ghosts and phantoms that came from the 2010 World Series victory that truly allowed me to see my team as more than cursed losers, so I know there’s both pain and pride in suffering. I just wish Keri could have wrapped it all up in a more interesting and less vanilla bow. “Up, Up and Away” is the sort of book that’s forgotten mere days after it’s been read; I’m actually struggling a bit with a review and I just finished the thing about ten days ago. Outside of some of the financial chicanery that allowed Montreal to get, and then retain, a baseball franchise in the first place, there’s really nothing particularly out of the ordinary here. Good players come and go, prospects don’t pan out, the team draw lots of fans, and then they don’t. 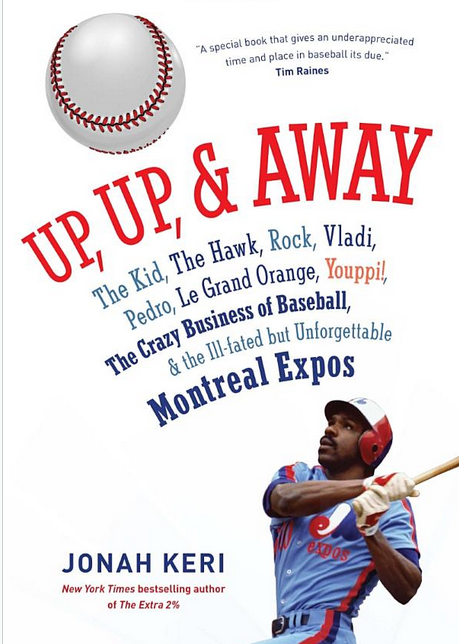 You know Keri had a blast putting this together, and his enthusiasm in recounting some of his personal tales from Jarry Park and Olympic Stadium with his baseball-crazed pals are all cuddly and stuff. Yet if you’re looking for something that captures the zeitgeist of 70s & 80s pro sports, this one’s definitely something of a footnote.